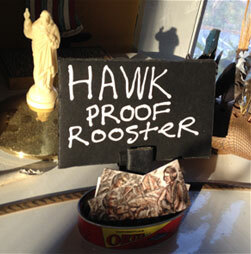 Hawk Proof Rooster is Nancy and Charlie Hartness, an old time string band music duo in Athens, Georgia. Okay. So we let Okra Pie go. What’s another symbol of the South? Ah, yes—the Fice Dog. 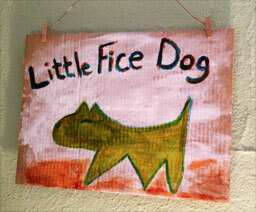 No, wait, how about Little Fice Dog? That’s it! So we tried that one out. Nancy made a sign. We played a couple of gigs. A woman came up to us and said I like your music. It’s different from what you usually hear in Athens, so I was wondering what kind of music is it you play and then I noticed the name Fee-chay on your sign. Are you guys Italian? We gave up on the band name thing for a while after that and just fell back to using our names, which in Athens is a black mark before you even get going. And then we got to know our next door neighbor David a little better. Tiki David, we called him, because he made giant Polynesian wood carvings with a chain saw in his back yard (I am NOT making this up). Tiki David also had a brood of bantams (banties as they’re called here). There were about a dozen in all—say nine hens and three roosters, or was it eleven all told with eight hens—–okay okay I’m starting to tell the story like some people I know who shall remain unidentified. Anyway, Tiki David’s banties ranged over the immediate neighborhood. They wore out the ticks and mosquito larvae. Cars stopped to let them cross the street. They murmured their pleasant little banty murmurs. Whenever danger was near, the brave banty rooster trio protected their flock. Over time however, banties being small and prone to distraction, the hawks started picking them off, one by one. The hens went first, then the roosters. When the last banty rooster was nabbed, Tiki David didn’t wait long. He went back to the J&J Flea Market to the poultry vendor’s stand. I need me some more chickens, he said. The poultry vendor pointed to a cage full of lively banty chicks and smiled. Nope. No sir, said David. I already had some of them, and the hawks got every one. I need something the hawks won’t get. What I need me is a HAWK PROOF ROOSTER. As we listened to Tiki David talk, Nancy and I knew that like many good things in life, this story had come as a gift, and now we had a band name.